The property at 1405 Round Hill Road is on the market for $824,000. FAIRFIELD — The Fairfield University section of town has smaller residential lots than other areas, and that creates a neighborhood atmosphere among residents. The gray Colonial house dark shutters at 1405 Round Hill Road sits on a parcel that allows it to be an integral part of the neighborhood, while also enjoying a bit of privacy. The 0.29-acre level property is a corner lot that shares one side with Limerick Road. But there is a second cul-de-sac, Shadowood Road, directly behind the house so there is no immediate neighbor to the side or the back. 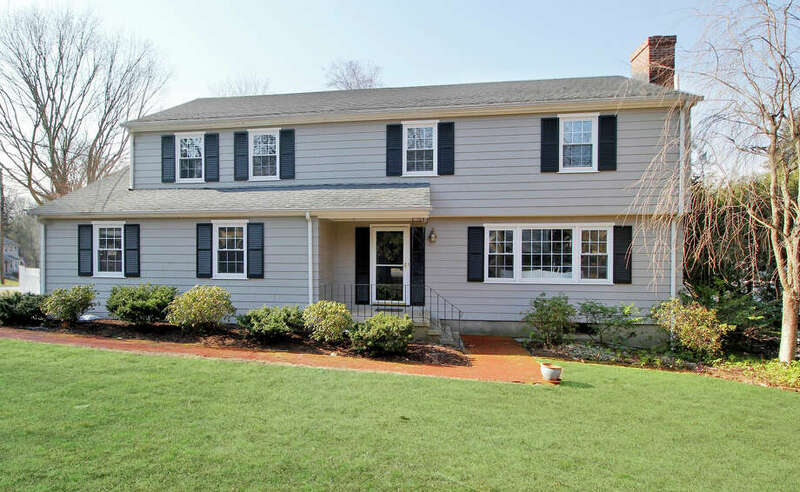 With proximity to many town amenities, the house is only 1.5 miles from the downtown train station, as well as restaurants and retail shops on and around Post Road (Route 1). Interstate 95 is also easy to reach in one direction and 3.5 miles in the opposite direction is the Merritt Parkway. One patterned red-brick path lined in Belgium block takes those who walk it to the backyard, and the other leads to the covered front entrance of the house, which was built in 1961 and has been “lovingly maintained.” It has also undergone updates within its 2,685 square feet of living space. There is good room scale and hardwood floors throughout most of the house, including in the kitchen. In the living room there is a fireplace with a mantel decorated with dentil molding. The formal dining room has chair railing and a built-in corner china cabinet. Features in the spacious kitchen include a pantry, marble backsplash, black granite counters and stainless-steel appliances: a five-burner Wolf cook top, two GE Monogram wall ovens and a Samsung refrigerator with French doors. The preparation portion of the kitchen is open to the eat-in dining area, which has a cathedral ceiling, track lighting, ceiling fan and a door to a large, raised wood deck. The den has a wood-burning stove, slightly vaulted ceiling and a sliding door to access the same deck. Take one step up to the family room where there is wall-to-wall carpeting and a bow window. Four bedrooms are on the second floor; the master is en suite and has granite counters. The mostly finished lower level adds another 588 square feet of living space, including a large playroom and storage space. For more information or to set up an appointment to see the house, contact Harriet Stone of William Pitt Sotheby’s International Realty at 203-913-1681 or hstone@wpsir.com.